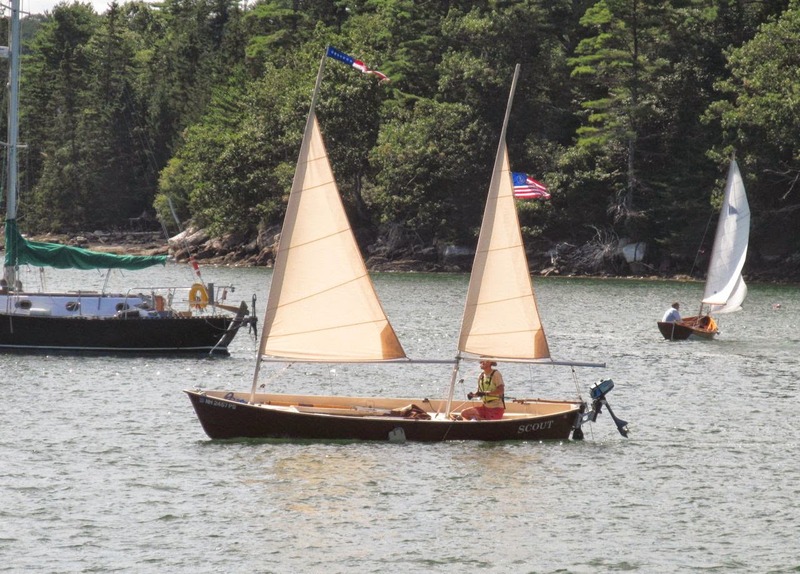 Goat Island Skiff Amateur Style and the Sea Pearl 21 Too: Progress! Yeah! Wet-on-wet, stem, quick dry-fit! Progress! Yeah! Wet-on-wet, stem, quick dry-fit! I was home for a few days, and I buckled down and got right to it. First I enlarged the holes in BH2 and 3. I want more room to store my gear: oars, extra spar, etc. etc. I was able to do this neatly and cleanly with my scrolling blade that I discovered in my blade set! Yo dummy! I'm much happier now with the results. Second: I wet-on-wetted the un-wetted sides of the BH's with epoxy to encapsulate the wood. Three layers, which got it quite thick I may add. Maybe a little too thick. I used squeegees and and a brush and the roller a la Storer. I must say I wasn't impressed with the roller method, I feel like I could get a smoother surface without it-- the roller left funny little bumps. I think the thickness is just sloppiness on my part and maybe too much epoxy. Needless to say, everything will be sanded down for paint/varnish whatever I decide. I'd love to do some brightwork, but I don't know if I want to do the work. I see lots of sanding in my future with the splotchy epoxy job. That being said, epoxy got everywhere, and it was a big mess, including the undersides of my BH's, despite carefully applying tape everywhere to hold the mess. I used painting masking tape, packaging tape that would have hung lower than the BH would have prevented epoxy from curling underneath and dripping onto the BH backsides that were already done. Then I cut the notches for the chinelogs into the BH's. This was more difficult than I thought it was going to be. I used my nifty Japanese pull saw, and it was awesome. I paid very close attention to bevels and carefully marked the boundaries of the notches. A few mistakes were made, but nothing that can't be saved or filled with epoxy. Taking my time instead of rushing this part was worth its while. 1. Cut out a rectangular blank of the stem from my stock. 2. Draw the stem out on the blank-- triangle on top, the front edge and then on the backside, the back edges graduating from 36mm at top to 22mm at the bottom. 3. Plane down the starboard and port sides from 36mm at the top to 22mm at the bottom. At this point, looking at it either from the stern or bow, I have a trapezoid that is wider at top than at the bottom. Still rectangular. 4. Now, all that is left is to remove the material from the backside to the bow point. Using the backside 36mm-22mm edge, I planed down the material to the front pointed bow. I left the bow a little wider than a knife edge, about the width of the sharpie pen mark. It's a little tricky to get the second side because there is now no longer a flat surface to work. I screwed on the stem to the bow pieces, with screws through ply backing as described in the Storer plans. This is hazardous, because once the screw gets into the backing it spins around like the devil and I'd have to push frantically for bite into the side of the boat or else the screw and backing ply goes zooming off the bow and then I'd slam the drillbit into the side of the boat leaving a good dent. A good method is to push the screw through the backing first so a little pokes out that it can be stuck into the side by hand to hold it in position. Watch your fingertips! So the stem went in and then I spent a while screwing around with BH's and and the transom and placing them more or less where they were supposed to go. I took some tie-down straps and cinched the stern together to get a visual idea of what the boat was looking like. It looks like a Goat Island Skiff! Amateur Style! But a GIS, nonetheless, the curvy midsection and straight knife-like bow are telling. I attempted to screw in BH1 but it was about as difficult as pulling my own wisdom teeth. Sagely, I walked away when one side of BH1 ripped away from the screws holding it into the port side. In the following picture you can see the gap between the chinelogs and BH2. Imagine BH1, which is just as bad if not worse. It's going to be a true WRASTLING nightmare to get that together, I think. I'm going to re-measure my BH's, make sure they are the right size, and do some brainstorming. BH3 looks gappy, but it's not bad, a little squeezing and it fits right in. Some things I noticed: The chine logs butted up against each other in the bow next to the stem. A little bit of chisel work took care of that, giving them more room. Also, my stem needs to be cleaned up a bit, especially the bottom portion. Maybe this will aid in screwing in BH1. As I said, I was impatient to actually see something, and I'm glad I did this today. Wow! Great stuff. This is going to be helpful to me when I get to the dry-fit stage later this month. Despite the struggles, she does look like a GIS. She looks great! I'm just starting a GIS too - you mentioned somewhere that you found good blog site containing stem instructions - can you send me the link? jab49@iinet.net.au Thanks.